Perkins Restaurant is a fast growing chain restaurant that is located all over the US. They offer all sorts of American food and bakery goods. There is a kids menu along with a senior menu for those that are of 55+ in years. 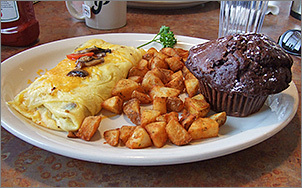 I went for breakfast at Perkins Restaurant on Green Bay's far east side near the East Town Mall. As you walk in there is a waiting area with wooden benches and a large blackboard on a side wall. The blackboard was made into a monthly calendar written in chalk and featured their specials each day of the month. Directly facing you is a counter with a register which is situated in between two clear glass cases filled with delicious looking bakery items such as pies, muffins, cookies, and brownies. To the left is a hostess stand where the host greeted me in a friendly manner, I requested a window seat and was told they could accommodate me, but they first had to wash the table off which was done quickly. The restaurant was crowded but also had a comfy atmosphere with large windows surrounding the inside with lots of comfy booths, hanging fresh green plants, and ceiling fans. The interior colors were medium browns and greens. The host immediately gave me the menus and my server then came to bring me a beverage while I looked at the menu. They have a big selection to choose from, I decided on ordering a build your own omelette starting with two ingredients for $7.59 with each additional item costing an extra 50 cents. I ordered mine with cheddar cheese, mushrooms, and tomatoes. I had a choice of hash browns or breakfast potatoes and I chose the breakfast potatoes; I also had a choice of three buttermilk pancakes, white or whole wheat toast, or one of their mammoth muffins I chose the chocolate, chocolate chip muffin. I also ordered a side of bacon for $2.59. They had a full staff on and everyone was very busy but after a reasonable amount of time my food came. The food was warm and the portions large. My omelette tasted good with a good deal of cheese in it and the potatoes were made crispy with seasoned salt and soft on the inside they were very tasty my bacon was cooked well but more soft and greasy than crispy. Now the muffin was definitely mammoth in size; it was moist and dense with lots of chocolate, simply scrumptious. Even though my server was very busy I was never in need of anything. 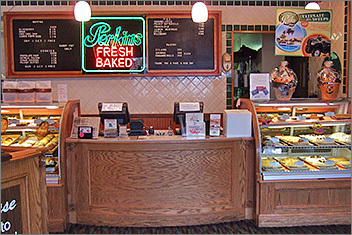 Perkins has friendly and efficient service and serves all the diner staples.